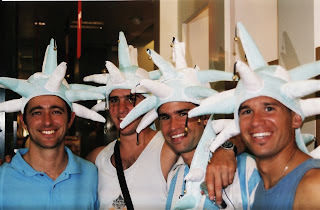 During the 2006 World Cup , I happened to be in Italy which was an extraordinary experience. Regardless of what city I was in – Rome, Florence, Milan, Verona, Venice – people poured out of their homes and gathered in the campos and piazzas. Televisions were dragged out of bars, and crowds formed, wine and pizza in hand to cheer and weep as the world’s best soccer teams battled in neighboring Germany. And while I can easily be swept up in the furor of the sport, I am a fair-weather soccer fan. I do, however, have my sporting event of choice: the Oscars . Gorgeous gowns... handsome men... hairstyles far more interesting that any old up-do... oh, and there are some movies involved, too. It is a night of fantasy and frippery which feeds that inner girly-girl in me on an annual basis. But this year there's an added thrill for me: Michelangelo's design will be under foot all evening. Architect David Rockwell designed the sets for this year's event. He also designed the Kodak Theater where the event is held, so he knows the space well. In fact, he has designed several other theaters including Cirque du Soleil's venue at Walt Disney World . But the architects who design the buildings rarely get to use the stages they lovingly craft. Not so for David Rockwell. While he is the first architect to design the sets for the Oscars, he is not a novice. On Broadway, he designed the sets for "Hairspray ," and he has been tapped to create sets for other theater productions including "Dirty Rotten Scoundrels" and the sets for the movie "Team America." For the Oscars , Rockwell has reimagined the Kodak Theater not as a grand thespian palace, but as an intimate nightclub. 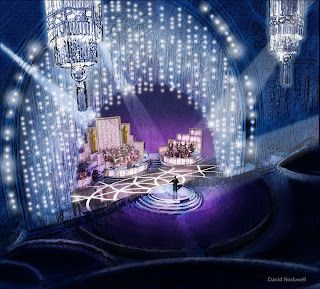 "We created a spatial and architectural solution for the 2009 Oscars that is based on storytelling, spectacle, and community," Rockwell explained. "We wanted to use a surprising and dramatic integration of technology and movement to celebrate the awards ceremony, which has become one of the greatest shared rituals of our time." But underneath the feet of the winners and the presenters, the floor pattern he chose is a replica of the paving pattern Michelangelo designed for the Piazza del Campidoglio in Rome -- an appropriate choice given his stated goal. 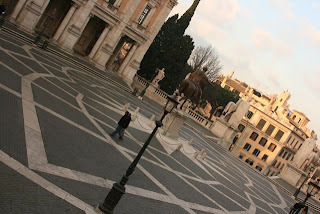 The Piazza del Campidoglio sits high atop the Capitoline Hill. When they say "all Roads lead to Rome" -- well, they actually mean that all roads lead to the Capitoline Hill. Literally. In ancient Rome, the Capitoline Hill was the center and most revered spot in all of the Roman Empire. By the 1500s, however, it was a muddy, disheveled hilltop that was impassable when it rained. Pope Paul III approached Michelangelo and asked him to redesign the hilltop which he did creating a grand and impressive piazza. The piazza has long held an important social and political function in Italian culture. It was the front yard, market place, communication center, and campaign headquarters for each neighborhood, village, town, and city. Frankly, it still is. 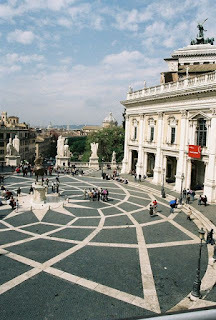 So when Michelangelo designed the Campidoglio as a piazza, he created a gathering place at the literal and symbolic heart of Rome. And David Rockwell has borrowed that same idea in creating an intimate but elegant Oscars . True, with 100,000 Swarovski crystals, 25 LED screens, a bandstand and orchestra, not to mention Hugh Jackman and any number of other stars, the stage at the Kodak Theater will be far glitzier than an average day on the Piazza del Campidoglio. But the Piazza del Campidoglio has seen its fair share of grandeur embodied in emperors, princes, popes, and politicians. 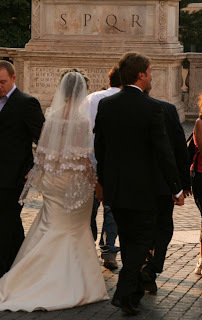 These days you are more likely to see brides, grooms, and their wedding parties as Rome’s City Hall, located on the Piazza, is one of just two places in Rome to have a civil wedding ceremony. By evoking the Roman piazza, Rockwell draws the audience together in a place worthy of emperors and kinds but open to soccer fans and brides, too. For Hollywood’s royalty gathers and invites the world to share in what Rockwell calls “one of the greatest shared rituals of our time.” As the world gathers to watch the Oscars this year, we will be hovering about our televisions in what David Rockwell hopes is an intimate and celebratory experience – gathered together in a metaphorical piazza. Incredible! Love the floor. Oh and the back of the wedding dress. Thanks for sharing. I love the Oscars! I thought he did an outstanding job. I have been watching the Oscars for a very long time, and I have to say: this was the best show I've ever seen! The set was gorgeous. Hugh Jackman was fantastic. And watching the gods and goddesses of Hollywood pay tribute to the nominees -- looking them in the eyes and giving them a very personal tribute -- was genuinely moving. As someone last night said, "There was more show and less biz." Well done! I'll happily gather in that piazza any day!